The townships of Branxton and Crookham (the latter incorporating Pallinsburn) are relatively well-covered by historic maps, with a number dating back to the mid to late 18th century. Crookham was surveyed and mapped in the 1760s (Northumberland Record Office ZMD 85, 2DE/15/1-2), whilst Branxton was covered by a series of maps produced c. 1780 (NRO 740 P98/1-2, 2DE 17/01), when the common waste of the township was finally enclosed. Altogether these include detailed maps of the two villages showing their layout before the common green was enclosed in each case. The Crookham maps also include the eastern end of the township next to the River Till, and the southern tongue extending towards Flodden Hill as well as the western and north-western parts of neighbouring Heatherslaw township, almost all of which are now included in Crookham Civil Parish. Civil Parishes replaced townships as the smallest unit of local government and administration in the late 19th century. Initially their boundaries were usually the same as their predecessors, at least in rural areas, but over time these have been subject to alteration, with Heatherslaw effectively having been suppressed and its territory being divided amongst the neighbouring civil parishes, and Crookham having absorbed the north-western quarter. However it is clear that the pattern of postmedieval landownership had already anticipated this change to a substantial degree. Part of the 1842 Branxton Tithe plan - NRO: DT 66SIn the case of Branxton, as well as the village and its immediate environs, the 1780 enclosure map (NRO: 2 DE 17/01) shows a strip of common land extending along the eastern edge of the township right down to its south-east corner. Some parts of this strip were ultimately assigned to the two neighbouring townships of Crookham and Heatherslaw & Flodden, as is made clear by the map surveyed in 1837 showing all the townships of Ford Parish in outline, and it is likely that the inhabitants of these townships all had intercommoning rights on parts of Branxton Moor dating back to the Middle Ages which were recognised by this allocation. A second corridor of common land, extending directly southward from the centre of Branxton village towards the moor, figures on another of the plans associated with the inclosure award (NRO: 740, P98, plan 2) showing how a broad corridor was reduced to a narrow road, doubtless hedged on either side. There are certain parts of both townships, however, that do not feature on detailed maps before the appearance of the respective tithe maps for the two townships, which were surveyed in the 1840s. This includes most of Branxton, comprising all the northern and western parts of the township, with the exception of the village and its immediate environs, and the entire Pallinsburn estate, forming the northern and north-western half of Crookham township. Even these later plans – the tithe maps and plans associated with the sale of various Branxton farms in 1848 – can be useful, however, as the field names they record often preserve useful information. What is known of the medieval history of the two communities from the medieval sources has been extensively covered by sections in Volume XI of the Northumberland County History (Vickers 1922, 104-16, 369- 401, 436-40). This deals particularly with the descent of the property from the mid-13th century, but deals little with the location or character of sub-divisions of that property. 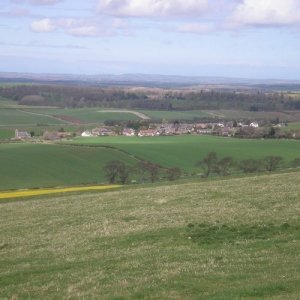 We know from this, however, that in the 14th century several landholdings in Branxton were in the hands of ecclesiastical foundations, including the hospital of St Thomas, Bolton (in Alndale), the Hospitallers and the chapel of St Mary at Etal which, in 1345 was endowed with five messuages and 107 acres of land in Heatherslaw and Branxton. Following the Dissolution the landholdings of both townships became concentrated in the hands of a few families, a situation which persists to some extent but has been somewhat dissipated by the sale of properties, principally in the villages themselves, during the 20th century. In addition to the evidence summarised in the County History, Piers Dixon has more recently provided a succinct summary of the documentary evidence in each case, with particular reference to the population and layout of the village and township (Dixon 1985, II, 97, 179-81). The sources which were particularly exploited in the latter study include the Lay Subsidy Rolls of 1296 (Fraser 1968) and 1312/13 and the Poll Tax return of 1377 (National Archives E179/158/6 & 32), and in particular the Border Surveys of 1541 (Bates 1891 (Border Holds), 34) and 1580 (Bain, Border Papers, I, 14-19). The agriculturally-rich north-east part of the county has suffered, therefore, from episodes of wholesale rebuilding and remodelling of villages as a result of the wealth generated by agricultural enterprise. Indeed, Branxton and Crookham were at the epicentre of major advances in agricultural practice from the 1760s, leading to the generation of wealth and wholesale redevelopment of both farms and their associated villages from that period until well into the 20th century. Branxton and Crookham were both extensively rebuilt in the mid-19th century leaving little of the pattern or built structure of the medieval and early post-medieval villages intact. Thus Crookham and its farms preserve no elements of built fabric pre-dating the mid-18th century, indeed contain few buildings pre-dating the mid-19th century, while Branxton fares only a little better with the partial survival of its medieval church and the suggestion of early masonry in Branxton House on the south side of the village. The location of the medieval Branxton tower, as noted above, remains elusive. None of the outlying farms of either township seem to preserve features older than late 18th century origin, although some merit closer inspection, as does the Blue Bell public house on the Pallinsburn which once formed part of a more significant settlement, including a smithy and associated cottages. Test pit 1. Crookham manse, in a paddock next to the main road where old maps show the presence of a building. Here a stone wall was revealed with abundant building rubble and small finds attesting to a 19th century date. (see right) Crookham Main Street, close to the site of a smithy which appears of Ordnance Survey plans until the 1880s. Below the deep topsoil (0.63 m) here was a brown silty sand containing ‘forge waste’, including iron nodules and lumps, slag, coal and charcoal together with domestic waste including animal bone and horn, and early post-medieval pottery. Test pit 4. Crookham Old Post Office, rear lawned garden. Excavation revealed top-soil containing 19th and 20th century pottery to the depth of natural sub-soil at 0.73 m.
Test pit 6. The location of test pit 6 behind Branxton House(see right) Branxton House, formerly post office and previously an 18th century farm. The removal of a deep deposit of top-soil (>0.5 m) containing coal/ charcoal and mortar flecks. Together with 19th century pottery, animal bone and metal finds resulted in the uncovering of a sandy silt at 0.76 m containing two medieval pottery sherds and a quartz flake sitting above the natural sub-soil which appeared at 1 m depth. Test pit 7. Branxton, behind no. 3 Blue Row within what in the mid-19th century was an enclosed area forming back-plots to houses fronting the main village road, although earlier maps show no settlement this far from the village core. Here, excavation in disturbed ground revealed pottery and other finds of probable 19th - 20th century origin and a gulley roughly trending NE , but no finds or features of early provenance. Test pit 8. Branxton, NW corner of large pasture field east of Branxton Old Vicarage. Here, only sparse finds of 19th & 20th century pottery were made. The test pitting revealed few traces of activity pre-dating the 19th century, but suggests that building remains survive of a cottage adjacent to Crookham Old Manse and those of a smithy, the origins of which may be earlier than 19th century, adjacent to Crookham Village Hall, while finds of medieval pottery adjacent to Branxton House may be significant in suggesting the location of medieval settlement activity in Branxton. Medieval township communities typically comprised three main components: the village settlement itself; the arable land or ‘townfield’, typically located immediately around the village and the common waste or moor where the inhabitants of the vill could pasture their livestock. There might also be smaller parcels of pasture, meadowland and woodland or wood pasture. Settlement was typically nucleated at this stage, that is to say the tenants’ farmsteads were normally all concentrated in the village forming the core of the township, rather than being dispersed throughout the territory, with each farm sitting at the centre of a compact and coherent farmholding composed of blocks of contiguous fields, as today. Such villages were often laid out in two rows on either side of a broad green and their plan could be very regular. The townfield was not divided up into separate fields by hedges or walls. Instead it was open, comprising blocks of ridge and furrow orientated in different directions. The blocks of ridge and furrow, which formed the basic subdivision of the townfield(s), were known as flatts or furlongs, and were separated one from another only by strips of uncultivated land known as baulks. Each tenant farmer – typically labelled a bondman, husbandman or cotman, depending on the type and size of his holding – held multiple strips of land, each strip cultivated to form a number of parallel ridges and furrows. These strips were scattered widely throughout the various flatts so that each farmer held land in all parts of the townfield rather than possessing a single concentrated block of land. In some cases the fields laid out when the townfields were enclosed and divided up fossilised elements of the earlier plan and may even preserve the boundaries of the flatts as the edges of some of the new fields. This was more likely when enclosure occurred during the 17th century or earlier and was accompanied by less radical survey than later on. In such cases the new field boundaries display the same reverse-S plan as the earlier ridge-and–furrow. The third component was the common waste or moor, which all tenants had access to in order to pasture their livestock. This would be fenced off from the townfield by a stout hedge, earthen bank and ditch or wall known as a head-dyke. To provide access to this moor, corridors of common land, known as outgangs, typically led out from the village green broadening out as they got further away from the village like the mouth of a funnel. These corridors would be fenced on either side to prevent stock straying into the townfield and damaging the crops. Livestock would only be allowed into the townfield immediately after harvest, when the animals would be allowed to graze on the stubble and thereby manure the field. The two enclosure plans showing the village in some detail (NRO 740 P98 Plans 1-2) demonstrate that the village occupied the same location as today with the parish church situated at the west end of the village. It seems unlikely that there was any radical reorganisation of the village layout between the end of the Middle Ages and the late 18th century when the enclosure maps were surveyed, so these maps may be accepted as giving an approximate indication of the medieval layout. Its form was essentially that of a two row village, its rows aligned roughly east-west, separated by a green which was significantly broader than the present road through the settlement. The buildings open directly onto the green with no front gardens of the kind common today. Instead tofts or larger croft enclosures were typically attached to the rear of the cottages or farms. The overall form of the village was less regular than some examples. In particular, the south row was interrupted roughly midway along by the outgang leading south to the moor, pushing the western part of the south row southward and broadening the green which had a roughly triangular form at this point. Some indication of the size of the medieval village population is provided by the documentary sources (cf. Dixon 1985, II, 97). In 1296 there were 9 taxpayers of the Lay Subsidy (Fraser 1968, no 286 – poorer inhabitants did not pay), whilst 30 adults were recorded on the 1377 Poll Tax return. In the 1541 Border Survey (Bates 1891, 34) the village was held by three landlords with a total of 16 husbandland tenants in the township (but only 12 tenants were listed in the 1580 survey – Bain, Border Papers, I, 14ff). John Selby, the major landlord, had a tower there, serving as a manor house and refuge for the tenants, the location of which is unknown, but it probably lay in the village itself. The watermill for the township, if it existed, may have lain to the south-east of the village, where mill pond Close, associated with Mardon farm mill, is depicted and labelled on an 1826 plan of Askew’s Branxton and Mardon farms. However, there is no evidence that this mill pond originated as a medieval feature and it is more likely that its origins lie in the agricultural intensification of the Branxton-Crookham area from the mid-18th century. Although several small streams, pools and bogs are depicted on this and earlier maps of the area, none of them, including the Pallinsburn, appear very suitable as a water source for a mill. Therefore, since Branxton is relatively poorly served by natural watercourses but is relatively hilly, especially in the south, it is reasonable to suggest that windmills may have been used as an alternative to water power. The post-enclosure field pattern is very regular, the individual fields generally being square or rectangular, indicating that the earlier system of strips and flatts was ignored. It thus provides little guidance as to the location or extent of the townfield. However fieldnames do provide better evidence, and the large rectangular field directly south of the village still bears the name ‘Townfield’ today. It is equally clear that the common moor lay in the southern part of the township, as evidenced by the position of Branxton Moor Farm in the southern third of the township. Some of the fields in that estate actually bore names such as Moor Field and Low Moor to further emphasise their origins (NRO: ZHE 31/02 – 1848 Branxton Moor Estate sale particulars & map), whereas none of the fields in the northern part of the township incorporate ‘moor’ in their names. The corridor-like outgangs shown leading southwards from the village on the inclosure maps of c. 1780 are another clear sign that the township’s main area of common grazing lay in that direction. Thus it is evident in general terms that the arable townfield of medieval Branxton lay in the north around the village and the moor to the south. The point of separation between the two can be discerned both on the ground and on maps from the 19th century onwards. Thus, on the tithe and 1st edition Ordnance Survey plans of the mid-19th century a slightly sinuous and continuous boundary can be seen extending from the site of Branxton Hill in the east across the full width of the township. On the west side of the Branxton village to Branxton Moor lane only one field’s width separated the village and the main east-west road across the township from this boundary, whereas on the east side they were separated by two smaller fields’ width. On the ground today this boundary takes the form of a continuous hedge with a ditch on the north side containing a small stream flowing eastward. It seems likely that this represents the head-dyke between the townfield and the common moor. Indeed the stream may have been created by the very act of digging the ditch of the head dyke, which would in effect have created a drainage ditch at the same time. Immediately to the south the ground begins to rise up to Branxton Hill, forming a logical point for the division between the two main functional territories of the township. Similar arguments with regard to the siting of key features and broad divisions within the medieval landscape apply in the case of Crookham. In 1541, 21 husbandlands were recorded in the Border Survey (Bates 1891, 34), whilst 22 tenants were recorded in the 1580 Survey (Bain, Border Papers, I, 14-19), indicating that Crookham was still a substantial village community during the 16th century. Again, its plan was that of a two-row village aligned roughly east west, though its form is also somewhat irregular (NRO: 2 DE 15/2/1 & 2). The green was apparently wider at the eastern where it formed a roughly triangular shape with the two rows splaying away from one another as they continued westward, but the south row abruptly shifted northward, markedly narrowing the green. However, this westward continuation of the south row occupied the north side of what appears to be an island-like enclosure within two arms of the green. It is therefore conceivable that the green was originally uninterrupted and continued to broaden out westwards leading to the long western continuation described below, but at some point in time part of this green was enclosed and the south row shifted northward. One of the 1766 maps (NRO: 2 DE 15/02/02) also shows a broad and rather irregular extension of the green, continuing north-westward from the area of Pallinsburn Cottage (buildings labelled Pallinsburn are shown in this position on the 1766 map), through the area occupied by Blue Bell cottage on the 1849 tithe map and, on the 1st edition Ordnance Survey, by Pallinsburn hamlet, before apparently narrowing to a simple lane. It is not clear whether this was just an external green for the village designed to provide additional common grazing or whether it also featured as an outgang leading to another area of common moor, for which we otherwise have no evidence, located in the western part of the township in the area later incorporated in the Pallinsburn Estate. In Crookham, again, it is likely that the townfields were located immediately around the village situated in the north-east corner of the township close to the River Till. The fields in this part of the township have a more irregular form, perhaps suggesting relatively early post-medieval enclosure of parcels of townfield land. Immediately to the south of the village, the land known as Marden Demesne was taken out of communal cultivation sometime in the early 17th century (Dixon 1985 II, 179). On the other hand the relatively thin tongue of land which extended southward from Mardon towards Flodden Hill was clearly moorland waste. Fieldnames in this area, recorded on the 1826 plan of Mardon estate, for example, include The Moor and Cella-Burn Moor, the latter immediately to the north of Flodden itself. Some land which had previously formed part of Branxton Moor was apparently attached to the western edge of this southern arm of Crookham township as part of the 1781 Inclosure Award and it is likely that the medieval tenants of Crookham had some intercommoning rights on Branxton Moor. 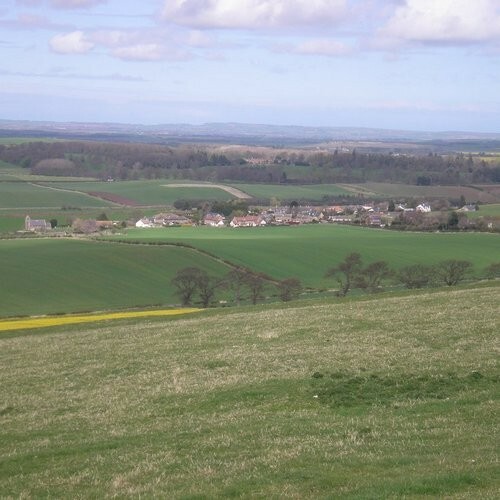 At the time of the battle of Flodden the landscape around both villages would have had a predominantly open aspect. Enclosure and subdivision of the townfields and moor was some 200 or more years in the future and both these blocks of land were largely devoid of hedges. Only the ditch and hedge of the head-dyke separating townfield from moor, the hedges bounding the outgangs, and those bounding the tofts and crofts associated with the village farmsteads would have in any way served to impede the movement of rival armies across the landscape. The cores of the medieval villages are probably in approximately their current positions, although only Braxton church survives as a direct structural link with the medieval period and early 16th century.